It will be interesting and possibly very embarrassing to see what the 1080ti and Titan XP can do. Wouldn't put it past Nvidia to artificially handicap non-RTX GPUs for raytracing. It is in the original NVIDIA article. Heavy RT titles like the new Metro game goes from 60FPS with 2080 to 18FPS with GTX 1080 Ti. Games like BF5 on other side "only" drop from ~75 to 45 FPS. Obviously those are NV numbers, so must be taken with that in mind. I would be interested to see how Bit-Tech test the Pascal cards GTX 1060 and above fare after the driver update, hint. Well, ain't that a funny thing. I'm sure there's a comparison between this and PhysX but I can't think of a witty way of doing so. So, Nvidia released the thing they announced back when RTX was revealed, and had already been demonstrated functioning with the Phasma demo? ::EDIT:: To add, DXR is not RTX. DXR should (when AMD get around to it) also work on Radeon cards as well as non-RTX cards, as well as a CPU fallback implementation. I suppose when "yes, Raytracing really is that slow when you don't have dedicated hardware units" sinks in the usual suspects will cry about 'old cards are nerfed!' as per usual. TBH I don't think cards without dedicated RT Cores will have to be handicapped any more than they inherently are. 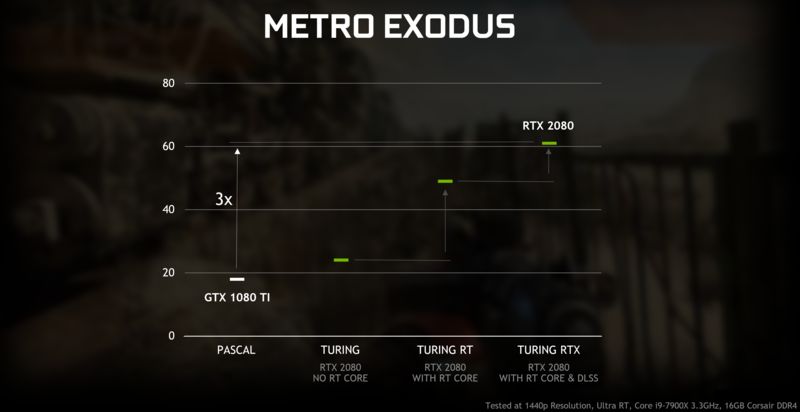 Again, as I said in the thread about Crytek demonstrating raytracing on Radeon GPUs: I thought the whole point of the RTX cards wasn't that only they could do RT, but rather that they had specific dedicated hardware that made them particularly suitable for RT? So Nvidia enabling raytracing on non-RTX GPUs doesn't necessarily render the RTX series redundant or mean "LOOOL Nvidia". They can't win, though, because either a) RT performance on non-RTX cards will be good, in which case they'll be accused of trying to gouge people for the RTX series, or b) RT performance on non-RTX cards will not be good, in which case they'll be accused of nerfing said non-RTX cards' performance in RT. Personally, I hope that RT performance across the board is decent, and improves further over time, as that's a win for everyone. I'll wait for some figures sourced from someone other than Nvidia for confirmation of this, of course, but per the article (pinch of salt required as ever) I suspect that we'll see RTX hardware giving a significant boost to RT performance (all else being equal, which isn't straightforward, but never mind), so the RTX cards will justify their price premium to some extent. To exactly what extent remains to be seen. I thought the whole point of the RTX cards wasn't that only they could do RT, but rather that they had specific dedicated hardware that made them particularly suitable for RT? As I (badly) tried to communicate in t'other thread, you're seemingly conflating two things. Nobody's saying that non-RTX cards can't do ray tracing: my Commodore 64 can do ray tracing. Using ray tracing for computer generated graphics dates back to Arthur Appel's 1968 algorithm - though that was technically ray casting, with ray tracing proper being credited to Turner Whitted in 1979. The first real-time ray tracing system was developed by Mike Muus in 1986, though it was technically pipped to the post by Osaka University's LINKS-1, which was first fired up in 1982, depending on your definition of "real time." The first commercial hardware cards designed exclusively for accelerating ray tracing algorithms to real-time performance levels, the Caustic family, landed in 2010. Hell, Radeon cards being able to do real-time ray tracing has been a thing since March last year. Nobody's saying that non-RTX cards can't do ray tracing; they're saying that (until, like, last night) non-RTX cards can't do DirectX Raytracing (DXR). Which they can't (couldn't): the only DXR implementation at present comes from Nvidia, and it relies wholly upon using the RT Cores in the Turing RTX GPUs. Doesn't matter how powerful your non-RTX graphics card is, it ain't running DXR. Until April, of course, when Nvidia's new non-RTX implementation lands and non-RTX cards will, for the first time, be able to run DXR. And whenever AMD gets round to turning GPUOpen Radeon ProRender into a DXR implementation, at which point DXR will run on Radeon GPUs as well and everyone can turn it on for five minutes before deciding that the frame rate loss ain't worth it. Nvidia: you can have Ray Tracing. But you need brand new super expensive RTX cards. CryEngine Ray Tracing Demo: Say again?! It is a tech demo for a not yet implemented feature in an engine, meaning games actually making proper use of it are at best several years away, at which point current GPUs will be museum pieces regardless of them costing £100 or £1000 now. Nvidia enabling DXR on non RTX cards will be to better support games that make minimal use of raytracing for only a small number of details (where the performance issues aren't all that relevant). 1) Devs working on games can work on ray tracing even if the card in their machine is not RTX, which makes ray tracing adoption in games more likely. 2) It makes RTX cards look good because they are so much faster then non RTX cards at ray tracing, and consequently anything without RTX look out of date. For the rest of us I don't suppose it matters much. They were already doing this: DXR dev prior to Turing cards shipping (started not long at all before the unveil) was done using DXR on Volta. For the time being I think it will be a checkbox I just leave unchecked. After CryEngine Ray Tracing Demo: Say again?! You need "on a Vega GPU 56 @4k"
This is the second time I've seen NVIDIA back pedal in two months. Buying a £2-10k GPU isn't exactly something every dev would be willing to spend on what's essentially an unknown in terms of adoption, for big well known developers it's probably a drop in the ocean but it's not exactly something i can see indy devs wanting to splash out on. The SVOGI using by this demo is a lower quality form of ray tracing, but it would still get accelerated by RTX cores if the Crytek dev's ever turned this into a real game. Hence it would still run much faster on RTX gpus. If it only manages 30fps in a highly controlled fly through with nothing going on then performance will be much worse in a real game - you'd still want an RTX gpu to play it. Hence I don't see why this would be a problem for Nvidia? I think we will see how well this actually works on non-RTX hardware (aka Pascal or AMD cards) when there is actual software available. But I LOL'd hard.